Gang Of Youths, Seth Sentry, The Smith Street Band, Urthboy, Dune Rats, Montaigne, Boo Seeka, Luca Brasi, Tash Sultana, L-Fresh The Lion, Sahara Beck, The Lulu Raes, Patrick James, Middle Kids, Bec Sandridge, Good Boy, West Thebarton Brothel Party, Dumb Punts, Gold Member, Planet and one lucky triple j Unearthed winner! 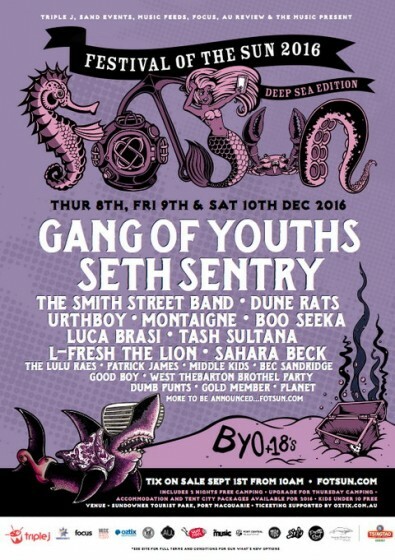 As the North Coast’s ultimate live-music event, bail on any plans locked in for the 9th and 10th December as FOTSUN 2016 is not to be missed! For super keen punters (what FOTSUNner isn’t? ), get in on the action early with FOTSUN Thursday, now becoming a yearly tradition! Secure the best camping spots, enjoy free art workshops, get in on the street art by FOTSUN’s resident graffiti artist Sigh Luxton and tuck into the food trucks on site. And as a new addition this year, punters can sit back and enjoy a special comedy set from one of Australia’s best upcoming acts. Bands kick off at 12pm Friday, so make sure you shake off the hangover and get up and dancing to welcome the first band of the festival. Tickets are available for $195 (+ booking fee) for two nights’ camping, and $45 per person for Thursday Night camping (+ booking fee). Car passes sold separately. For those who prefer the VIP treatment to setting up a beachside campsite, a limited number of cabins and cottages are available in conjunction with Sundowner Breakwall Tourist Park. In addition, overnight and ‘day’ Tent City packages will be available, allowing festival goers to be close to the entertainment in a secure precinct. Free shuttle buses will be running all weekend and include a concierge service, which drops punters without cars right to their camping sites. FOTSUN is an 18+ BYO (yes, STILL BYO!) event, however families are encouraged to attend; children under 10 receive free entry when accompanied by an adult. Tickets go on sale Thursday, 1 September 10AM, with only 3,000 available, so set your iCal, scribble in your diary and top up your credit card as it’s no secret that tickets for FOTSUN are a hot commodity and will sell out swiftly.